At Yasou Mykonos we feature a revamped Greek style menu. Stepping into Yasou Mykonos will bring you the experience of the Island of Mykonos with its beauty, design, and cut stone pathway. The aroma of fresh seasoned rotisserie chicken with the distinguished smell of basal from the window, the flavor of our Mediterranean menu will have you seeking more and more. 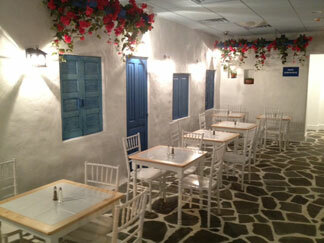 Yasou Mykonos features an open kitchen, plenty of seating, and a friendly staff. As we open our doors to the community and the surrounding areas we hope that you will discover a piece of a Greek island combined with Greek delicacies and hospitality. Using traditional recipes that we learned from our ancestors and introducing the Mediterranean way of eating we hope that you will discover new flavors, out of the ordinary. As if you were sitting in a Greek alleyway on Mykonos Island, all that is missing is the Aegean sea.